Number 3 piñata measures 20 inches tall by 16 inches long by 3. 75 inches wide. 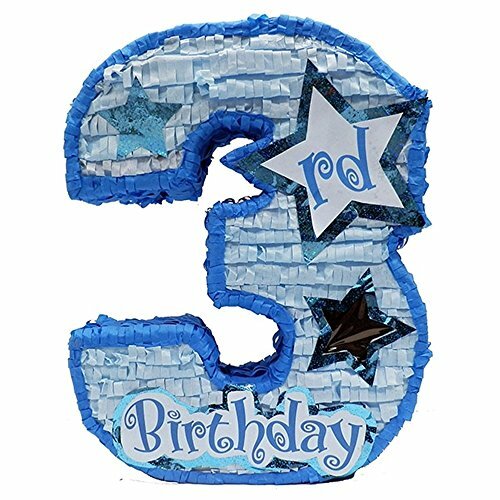 This beautiful 3rd birthday piñata is decorated with stars made of holographic paper to give the piñata a shimmering accent. Pinata features a transparent star-shaped window so the kids get a peek of the candy and toys that the piñata is filled with. This number 3 piñata is 20 inches tall by 16 inches long by 3.75 inches wide. Pinata holds up to 3 pounds of candy and toys enough for 8 guests (sold separately). Makes a gorgeous table centerpiece decoration, fun party game and unique photo prop.